On July 21, 1853, the New York State Legislature enacted into law the setting aside of more than 750 acres of land central to Manhattan Island to create America’s first major landscaped public park; they would soon refer to it as “the Central Park.” Many socially conscious reformers understood that the creation of a great public park would improve public health and contribute greatly to the formation of a civil society. Immediately, the success of Central Park fostered the urban park movement, one of the great hallmarks of democracy of nineteenth-century America. The design, one of the great masterpieces of American art, was the result of the 1858 competition won by Connecticut-born journalist and agriculturalist Frederick Law Olmsted (1822-1903) and British-born and trained architect Calvert Vaux (1824-1895). They named their plan “Greensward” for their preferred landscapes of sweeping meadows and vast water bodies designed to appear limitless, while brilliantly belying the Park’s long and narrow rectangle within New York City’s rigid grid. These grand pastoral scenes were carefully juxtaposed with the intimacy of picturesque woodlands featuring dense plantings, meandering streams, and dramatic rockwork arranged to include naturalistic caves, grottos, and cascades. Moving though these orchestrated views would be the antidote to the congestion and unforgiving pace of work and the crowded conditions in which much of the soaring population lived. 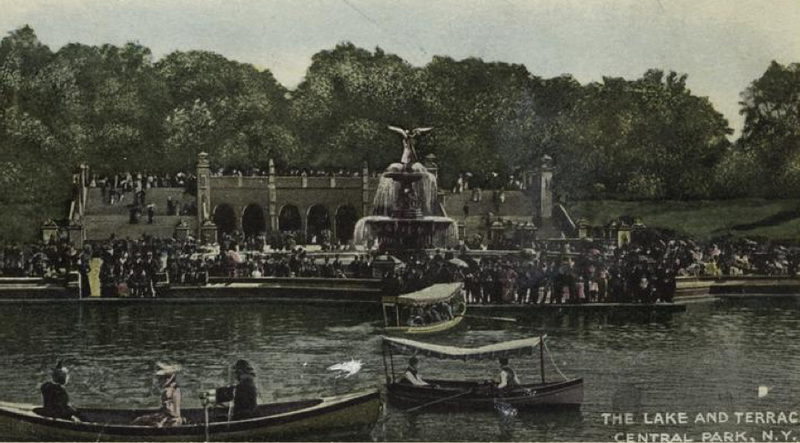 And because the designers recognized a need for civic socialization in their plan, they created a formal Mall, the grand elm-lined promenade and the main architectural feature, Bethesda Terrace, a two-tiered esplanade featuring elaborate carvings and a central sculptural fountain that eventually became Angel of the Waters when American artist Emma Stebbins was awarded the commission. The Mall, c. 1902. Photo courtesy of the Library of Congress. Visitors experienced these varied park scenes through a brilliant system of intertwined recreational roads: twenty-eight miles of pedestrian paths, six miles of undulating drives to be shared by both equestrians and carriages, and a rural bridle trail exclusively for horseback riding. Central Park’s six-mile tree-lined perimeter offered an urban promenade that acted as a buffer between the city and the Park. To ensure the safety and psychological peace of mind for all Park visitors, Calvert Vaux and/or assistant architect Jacob Wrey Mould created a series of ornamental bridges that separated walkways for quiet strolling from the faster horse and carriage traffic. The design competition required the inclusion of “four or more” transverse roads that crossed the Park at intervals and was open to city traffic both day and night. The creation of four below grade roadways — 65th Street, 79th Street, 86th Street, and 96th Street — are Olmsted and Vaux’s most innovative feature. These external arteries, artfully camouflaged behind dense vegetation, ensured visitors the continuity of a purely rural experience within the boundaries of the Park. Central Park was also designed as a vital cultural resource, offering flexible spaces for music and the visual arts, passive recreation such as sketching and birding, and active sports such as boating, ice skating, baseball, tennis, and croquet, and an outdoor classroom for the appreciation and study of botany. The Lake and Bethesda Terrace. By the early twentieth century, vicissitudes of the social, political and economic climate threatened the fabric of Central Park and caused its first serious decline. Robert Moses, Park Commissioner from 1934 to 1960, received federal funding for the restoration of many eroded landscapes and crumbling structures, and embarked on massive public programming for the post-Depression populace. When he left office, however, there was no management strategy for maintaining those improvements or educating Central Park visitors in proper stewardship, and for the next two decades the second — and most devastating — decline took its toll on the fragile 843-acre Park. Physically Central Park was in a chronic state of decay. Meadows had become barren dustbowls; benches, lights, and playground equipment were broken, and the one-hundred-year-old infrastructure was crumbling. Socially, the Park bred a careless, even abusive attitude as evidenced by unchecked amounts of garbage, graffiti, and vandalism. The perception — and in many cases, the reality — of Central Park was of a lawless and dangerous ruin. Despite a workforce of over three hundred Parks Department employees assigned to Central Park, there was no accountability. New York City had abdicated responsibility as Central Park steward and, as a result, this national treasure became a national disgrace. To help remedy this troubled situation, concerned citizens George Soros and Richard Gilder, under the aegis of the Central Park Community Fund, underwrote a management study of Central Park in 1974 by E.S. Savas, who was at that time a professor of public systems management at the Columbia University School of Business. The groundbreaking study proposed that two important initiatives be implemented to ameliorate the conditions in Central Park: one, that a chief executive officer be given “clear and unambiguous managerial authority” for all Central Park operations, and two, a Central Park Board of Guardians be created to oversee strategic planning and policy, thereby instituting private citizen involvement in their public park. The study’s first proposal resulted in the appointment in 1979 of Elizabeth “Betsy” Barlow (now Rogers), a Yale-educated urban planner and writer, who became the newly created Central Park Administrator, charged with overseeing all aspects of Central Park’s daily operations, in essence the chief executive officer recommended in the Savas study. For four years before her appointment, Rogers had been overseeing the Central Park Task Force’s program for summer youth interns, eventually becoming the head of that small, private organization, financially separate from the city but existing under the aegis of the Parks Department. Given her new official status and responsibilities as Administrator, Rogers first conceived of and then helped to create a revolutionary public-private partnership with the support of then Park Commissioner Gordon Davis that would bring private monies and expertise in partnership with the City of New York to manage and restore Central Park. 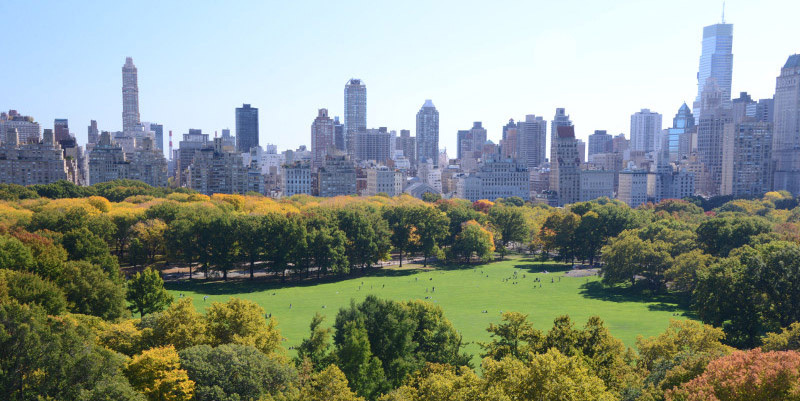 In 1980, the two most prominent private advocacy groups, the Central Park Task Force and the Central Park Community Fund, merged to become the Central Park Conservancy — the citizen-based Board of Guardians that the Savas study had essentially recommended. Under a Conservancy-funded master plan, the gradual restoration of those decrepit landscapes evolved, and success bred success. As the Conservancy showed its ability to protect and maintain its investment, many more private individuals, foundations, and corporations put their trust and their money into the restoration of Central Park. Between 1987 and 2008, the Conservancy led three successful capital campaigns toward rebuilding Central Park, ensuring the completion of the Park’s transformation. Most importantly, for the first time in Central Park’s turbulent history, the Conservancy created an endowment to ensure a sustainable green and healthy future for Central Park. The Great Lawn, before and after restoration in 1997. In 1998 a historic management agreement between the Conservancy and the City of New York formalized the then 18-year public-private partnership. With that contract Douglas Blonsky, who began his career in 1985 in the Conservancy's Capital Projects office as a landscape architect supervising construction projects, assumed Rogers’ title of Central Park Administrator. In 2004 he assumed the additional role of President and CEO of the Conservancy, responsible for not only Central Park’s management but also all fundraising and administrative duties. Blonsky created innovative management practices to ensure that those healthy new landscapes would have a skilled and dedicated staff to maintain them in a professional manner. His clear vision for a well-managed and well-maintained park took the Conservancy’s design and restoration vision one step further with the implementation of the Zone Management System, which brought accountability, pride of workmanship, and clear and measurable results to the Conservancy and Parks Department staff under his jurisdiction. Under this pioneering system, Central Park is divided into 49 geographic zones for managerial purposes, each headed by a zone gardener, who in turn supervises grounds technicians and volunteers. Central Park's restorations gradually fostered important social changes in public behavior that returned the sanctity of public space to Central Park and ultimately to New York City at large. The American ideal of a great public park and its importance as a place to model and shape public behavior and enhance the quality of life for all its citizens once again defines the measurement of a great municipality. Toward this goal, the Conservancy was first in its demonstration of zero tolerance for both garbage and graffiti. An immediate call to action came when even the slightest sign of vandalism appeared in the Park — a busted lamppost or broken bench, for example — and became the tipping point that turned public opinion of Central Park from one of dire repulsion to one of deep respect. In 2016, the Central Park Conservancy launched Forever Green, a ten-year campaign to restore and preserve Frederick Law Olmsted and Calvert Vaux’s vision for the extraordinary landscape of Central Park. Following decades of investment by the Conservancy in essential rebuilding and infrastructure, this ambitious project led by Anne S. Harrison, Thomas L. Kempner, Jr., and John Paulson, will raise $300 million to enable vital long-term planning for the entire Park, its woodlands, historically and architecturally significant structures, playgrounds, and more. Just as Central Park was the leader in the birth of urban parks, so today it is leading the rebirth of urban parks, public green spaces, and quality of life movements. With the Central Park Conservancy Institute for Urban Parks, the Conservancy is developing programs that advance the stewardship of urban parks and green spaces. City officials and park professionals from across America and around the world come to the Central Park Conservancy Institute for Urban Parks to learn of its best practices to restore and manage their local parks. On March 1, 2018, Elizabeth “Betsy” Weinberg Smith became President and CEO of the Conservancy. An avid supporter of urban parks and open spaces, Smith had served on the Conservancy’s Board of Trustees since 2014, as an advisory member of the Institute for Urban Parks, and previously worked as NYC Parks Assistant Commissioner following a 25-year career in finance. Today Central Park has never been more beautiful or better managed in its 160-year history, and the Conservancy is proud to be the leader of the Park’s longest period of sustained health and beauty.